I was quite pleased with this Disappearing Nine Patch patchwork top for a small quilt and I was pleased at how I was improving at getting the corner seams to match. That was until I decided that I would have a go at machine quilting. I prepared well. I read reams of online written material and looked at countless online videos. I knew it all. I considered the variables - the sewing machine, thread , needle, tensions, foot, pressures and stitch length in relation to the layered fabric I wanted to stitch. I tried them out on a sample pieces. All seemed well. But I was deluding myself. Once I got onto the real thing this is what happened. Invisible thread - kept snapping. The ditch in the stitch foot raced the bottom layer through at twice the speed of the top layer. My diagonal quilting looked ghastly - the thread was all the wrong colour for stitching on top of such a variey of coloured fabrics. I unpicked the lot. That's when I took the above photo. By this time I was using the Walking Foot but the tension would look OK for a moment then the tension would go haywire. Stitch in the Ditch became Stitch somewhere in the Vicinity of the Ditch,. Everything I did became a case of Exterminate ! Exterminate ! Unpick ! Unpick ! Last hope - Yesterday when buying some extra reels of cotton at a haberdashery the assistant said that she always used a Metallic needle for quilting so I tried that and now everything is just purring along beautifully. I had already tried some-one else's favourite, a Denim needle and it wasn't too bad, but the Metallic one is just perfect. It beggars belief, though. Everything I've tried was a size 80 yet the needle designed for doing machine embroidery with metallic threads is the one that works best for me. Any problems now relate to my ability to feed the fabric along the stitching line into the walking foot. At the moment it's quilted with lines 12 1/2" apart. Next step I suppose will be to stitch in the ditch half way between these lines. That's going to look awfully boring on the back but I don't want to tackle any stitching which involves massive amounts of rotating the quilt to stitch around smaller squares. My machine is a few years old. A Janome Memorycraft 3500. All this time and we have never been on such intimate terms as we have been the last few days ! Great colors in your D9P. Don't worry about a boring back. That's not what people are noticing. I am also a stitch in the ditch quilter (invisible thread on top) and found mine tangled and then snapped. There is one thread guide on my machine where I now "wrap" my thread in a small patch of fabric. That helped a lot. Metallic needles have worked for me along with quilting needles. It seems that there are general rules that can apply to machine quilting but machines, like the operators, have personalities that may break the 'rules'. What works is 'right; what doesn't is 'wrong'--for your situation. Thinking outside the box and exploring options many times leads to some interesting/creative solutions that one can share with others on these wonderful blogs! 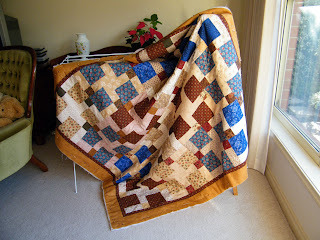 Love your quilt....cozy. Many thanks for the helpful comments. After this quilt I'll persevere with the invisible thread as I like the idea of it. I'll try and work out which part of the guide is the source of the snapping. Glad to hear other people use metallic needles. I'm still amazed at the difference it made.